(CNN) -- Thirty armed militants were killed on Thursday during a fight with troops in southern Afghanistan, the U.S. military said. 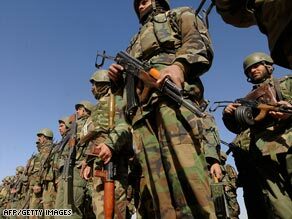 Afghan National Army (ANA) soldiers listen to a speach in Nadi Ali district, Helmand province, on February 5, 2009. The incident occurred in the Gereshk district of Helmand province, and the militants were killed by Afghan soldiers advised by coalition troops, the U.S. military said in a statement. Afghan soldiers had been conducting "combat reconnaissance in an area of known militant presence," the statement said, when militants fired at the troops with small-arms and rocket-propelled grenades and a firefight eventually broke out. The troops made sure non-combatants were not in the area when they fired at the militants, the military statement said. One Afghan soldier received minor injuries in the incident. "This engagement was yet another blow to the militants, who are quickly losing their ability to operate in Helmand province," a coalition official said in the statement. "The Afghan National Army is working to rid Afghanistan of extremists who are only trying to destabilize the country and sabotage Afghan freedom." Meanwhile, an Australian soldier has been killed by an improvised explosive device Thursday during operations in southern Afghanistan, Australia's Defense Ministry said. He is the second Australian to be killed in Afghanistan this week. Ten Australian troops have died in the Afghan conflict. Defense Force Chief Angus Houston said the "soldier was trying to clear the route of an Australian patrol when the explosion happened." He was trying to defuse the explosive when "there was an explosion and he was killed," Houston said. Houston said the soldier was an expert in countering roadside bombs. "He lost his life trying to make the environment safe for his mates. At this point in time we do not know what caused the explosion," said Houston, who did not say where in the south the incident occurred. On Monday, Australian Cpl. Mathew Hopkins was killed in a firefight in Afghanistan. He had been part of a joint patrol near Kakarak, north of Tarin Kowt in Uruzgan province.